Sift flour, baking soda and salt with a wire whisk and set aside. In a medium size bowl, use a hand mixer to beat butter and peanut butter. Add 1 cup sugar and beat until fluffy. Add egg and vanilla, beat until mixed. Using your hands, roll dough into 1 to 1 ½ inch balls and then roll the balls in sugar to coat. Remove from the oven. 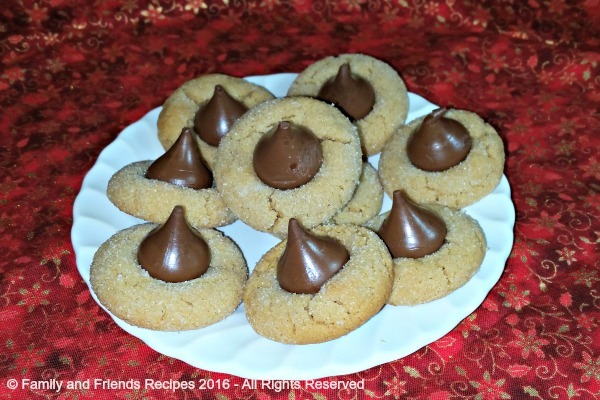 While hot and still on the baking sheet, gently press an unwrapped Hershey’s Kisses candy into the center of each cookie. The pressing will anchor the chocolate and create pretty crackles in the cookies. There are lots of recipes and variations for this recipe, but this is my tried and true version. Do not use all natural or organic peanut butter in this recipe. My preferred brand is Peter Pan Smooth. An 8.5 ounce bags of kisses should contain 50-54 wrapped kisses, which should be plenty for this batch of cookies plus a couple extra for the cook’s helper – especially if your helper unwrapped all those kisses for you!